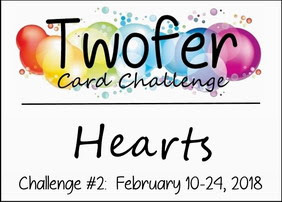 So excited to see the Twofer Challenge for February was posted today! And here are my two cards. So what did I use that was the same? The Heart Confetti Collage die from Poppy Stamps and the metallic gold paper. 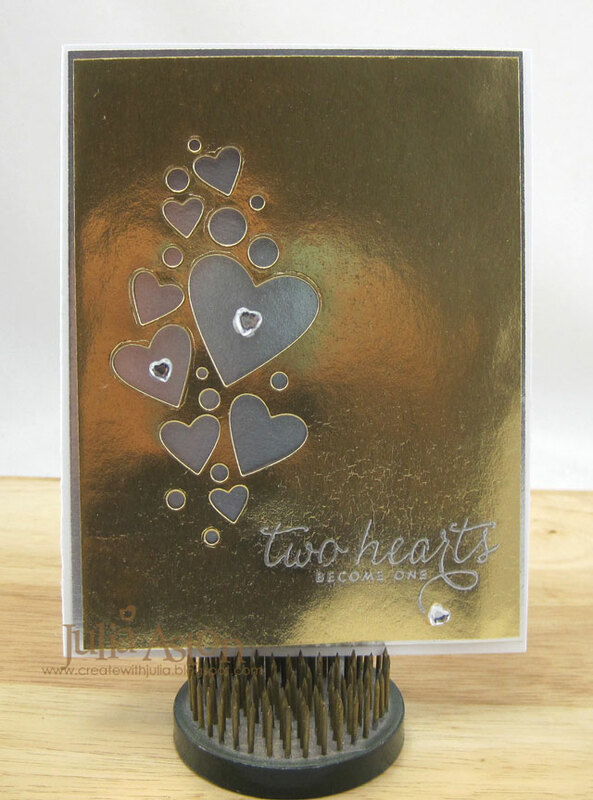 My first card is a wedding card - I silver embossed the sentiment on the bottom corner (two hearts become one) - it's hard to see it in the photo above with all the shine of the gold paper but you can see it better in the photo below, and I adhered 3 crystal hearts on the card. 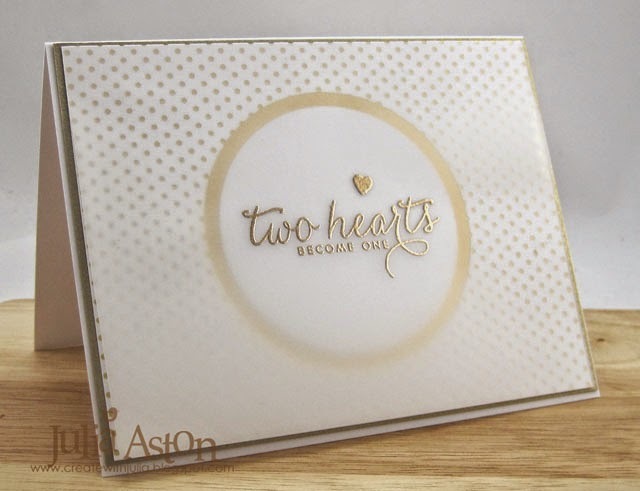 The die cut gold panel is layered over a silver panel that shows through the hearts and it's all adhered to a white card base. Inside my wedding card I stamped: "May your life together be full of love and your love be full of life" from Technique Junkies. 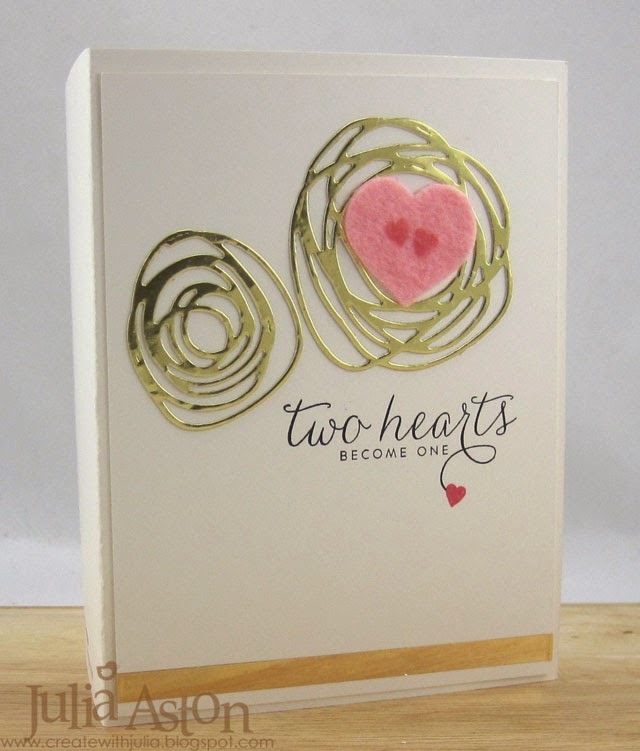 My second card is an Anniversary card and I used the positive pieces from the die cut used above (the hearts), layering them over the heart DP with foam dots. 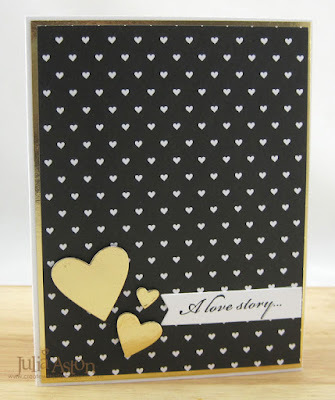 I stamped the sentiment on a die cut sentiment strip and adhered it next to the hearts. 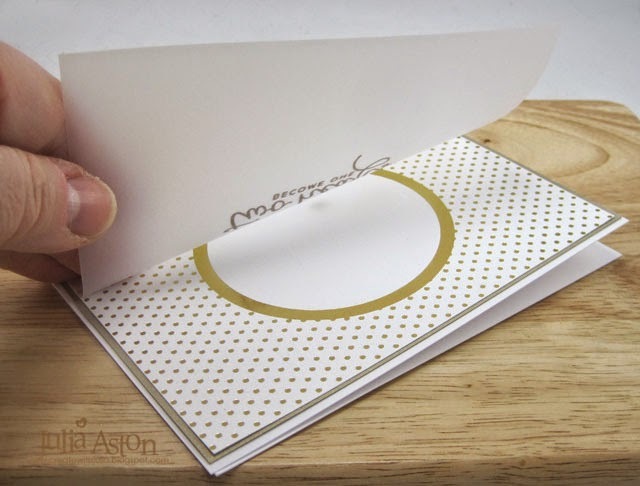 The DP is layered to a gold panel and it's all adhered to a white card base. Inside I stamped: "Happy Anniversary - May you enjoy many more happy years" from Papertrey Ink. So are you joining in with the Twofer Challenge? 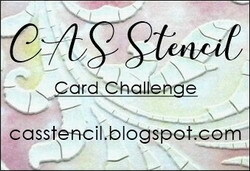 You'll find all the instructions for the challenge here and we have until Feb 24th to link up our cards! Stamps: Love and Marriage - PTI (retired), inside Life Full of Love - Technique Junkies. Paper: white - PTI, Gold and Silver from Kraft Stock Metallic - Tim Holtz/Idea-ology. Accessories: Heart Confetti Collage die - Poppy Stamps, heart rhinestones, foam dots. 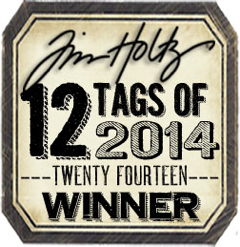 Stamps: Mona Lisa Moments - Cornish Heritage Farms (retired), inside Think Big Favorites #24 Mini Stamp Set - PTI. 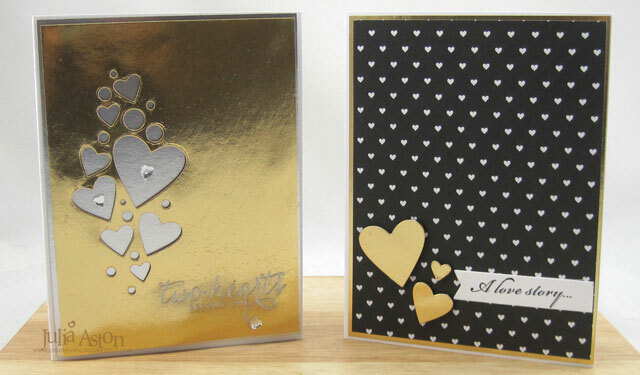 Paper: hearts on black from Modern Metallic Paper Pad - DCWV, white - PTI, Gold from Kraft Stock Metallic - Tim Holtz/Idea-ology. 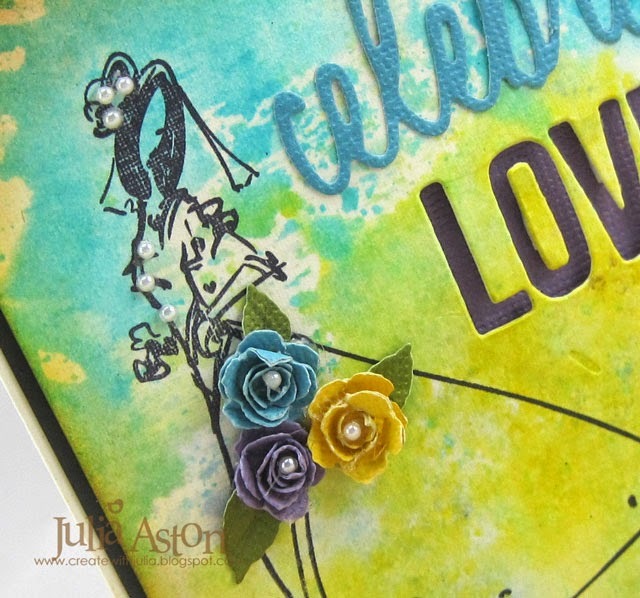 Accessories: Heart Confetti Collage die - Poppy Stamps, Sentiment Strip Die - MFT, foam dots. I have a box of cards I keep in the closet so I always have a card for any occasion - and occasionally I sell them to friends as well. I needed a few more the the "Wedding" section and so made this card. I used an older die from MFT - Heart full of Love - that's no longer on their website and a new to me die for the scalloped edge - Notes: Scalloped A2 Vertical die from PTI for the front panel. It was so easy to put together that I made 4 of them while I had the supplies out on my work table! 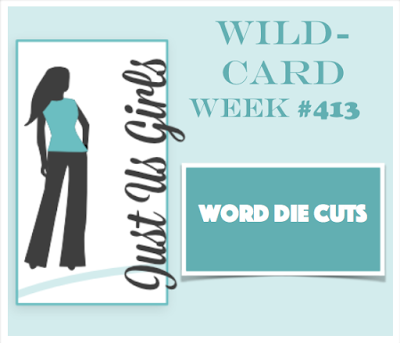 I have another frame card to share today (see this post for my first). 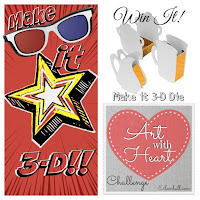 I die cut the frame out of white Little Sizzles Mat Board from Sizzix. 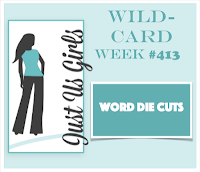 I used the Sizzix Frame/mailable die and this time I used the opening to frame my sentiment. I embossed the frame panel using WV Archival Tree Branch ink and WV Sky Blue Embossing Powder. The ink soaked into the matboard in spots so the embossing powder didn't stick, giving the frame a lovely aged look. I reinked along the top where a lot of brown still showed, sprinkled it with powder and embossed it again. 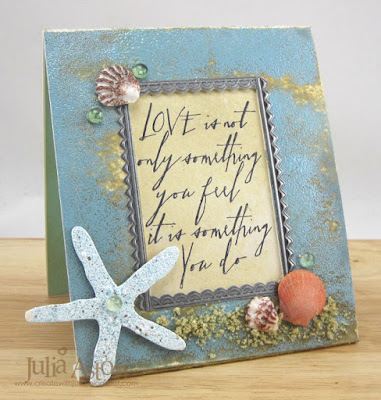 I cut a panel of Rustic Cream cardstock, laid it behind the frame, traced the opening and then stamped the sentiment from Handwritten Thoughts by Tim Holtz. I erased the pencil markings and sponged the panel with Old Paper Distress Ink. Then I spritzed it with water to create some waterspots (which didn't show up too much!). I ran adhesive along the backside of the frame and adhered the sentiment panel facing out. I added some Industrious Stickers/Frames and Trims to the edges of the frame. Although they are sticky backed - I added some Scotch Quick Dry adhesive to secure them to the glossy embossed surface. 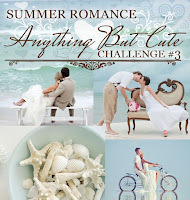 I added some tiny seashells that Kent and I picked up on the beaches while on a vacation to Sanibel Island several years ago. (I knew I'd want them someday!!) I also added some dew drops. The embossing is REALLY shiny IRL. I die cut a starfish out of the mat board using the Sand and Sea Die from Alterations. 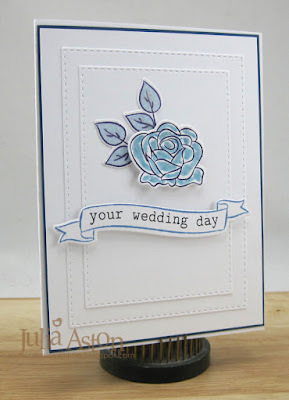 I embossed it with Frantage Shabby Blue Embossing Powder. I added some sand that I had in a container saved from Tim's recipe in his July 2014 Tag. 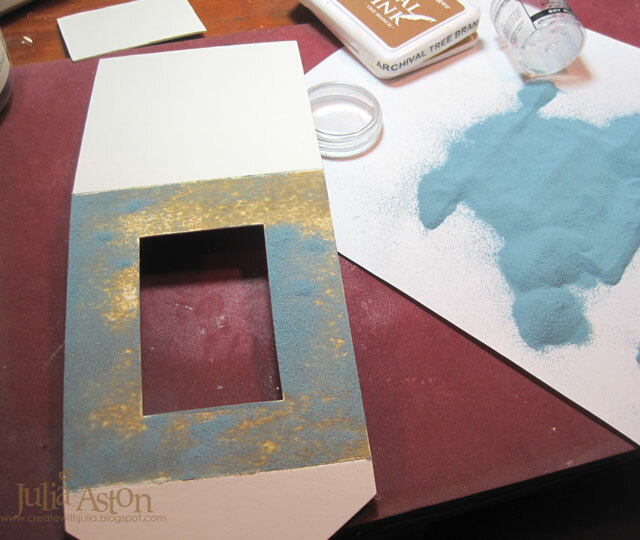 Basically, I mixed Antique Linen Distress Glitter, Antique Linen Distress Embossing Powder, Clear Utee, and Glossy Accents. But, as I said, I had mine in a cup left over from last year's tag - and it was VERY dry - so I squeezed some Scotch Quick Dry adhesive along the place I wanted the sand and sprinkled it on - pressing the 'sand' a little into the adhesive - and let it dry. 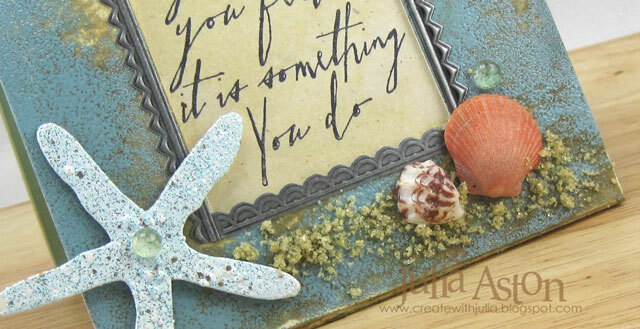 I added the shells and starfish with foam dots. Here's a side view showing how the frame stands up - and it will fold up and fit into a regular A2 envelope as it measures 4 1/4" x 5" - although my little star fish will probably loose one of her arms since it sticks over the side. I layered a piece of Coredinations paper on the inside where I can write or stamp a sentiment - maybe Happy Anniversary - or Happy Wedding Day - whatever I decide to use my pretty beach theme love card for! Ink: Archival Jet Black, Ranger Distress Old Paper, Wendy Vecchi Archival Tree Branch. Accessories: Frantage Shabby Blue Embossing Powder - Stampendous, Sand and Sea Die - Alterations, Frame - Mailable die - Eileen Hull/Sizzix, Wendy Vecchi Soft Sky Embossing Powder, Antique Linen Distress Powder, Antique Linen Distress Glitter, Thick Utee - Ranger, Black Embossing Powder, Glossy Accents, Industrious Stickers/Frames and Trims - Idea-ology, shells from beach, dew drops, glue dots, Scotch Quick Dry Adhesive. 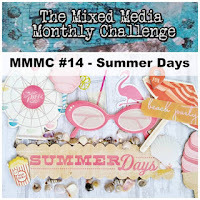 Today Sandy is our Creative Guide Hostess for the June A Vintage Journey Challenge. 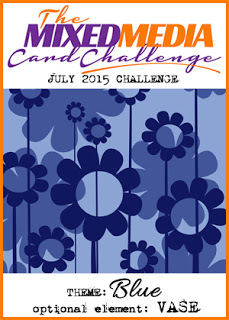 Her challenge to us this month is Celebrations - in her words "Share your celebrations with us. 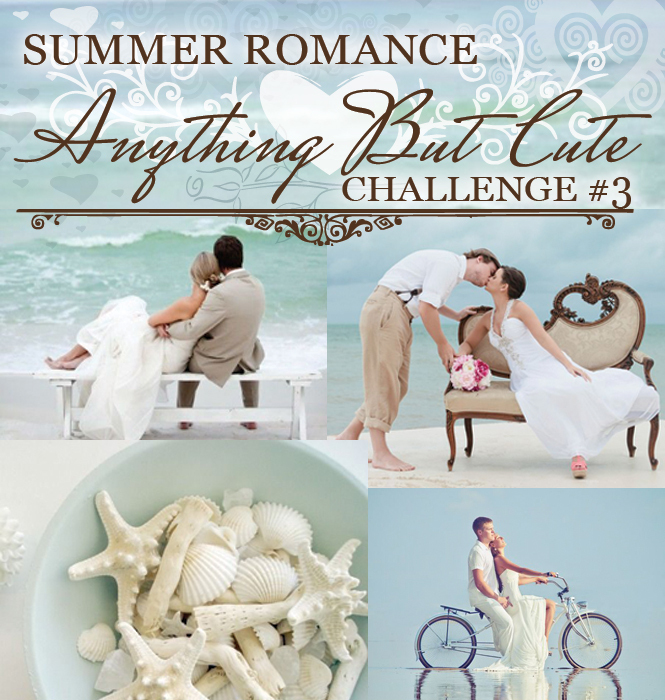 It can be the end of the school year, a birthday, Father's Day, a wedding or a special anniversary. Use any of Tim's products or techniques." I got out the lovely Runway Stamp set, the Script and Block Thinlet Celebration Words sets and the new Tiny Tattered Florals. I started out by stamping the bride on a piece of Vintage Cream Linen Cardstock using Archival Jet Black Ink. 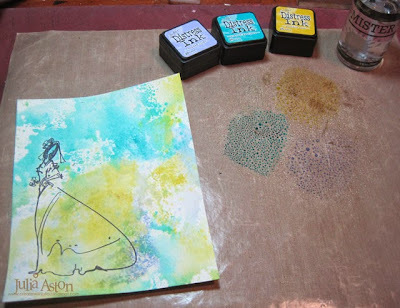 Then I rubbed Ranger Distress Inks in Shaded Lilac, Peacock Feathers and Mustard Seed onto my craft mat, spritzed them with water and dragged the stamped panel through it. I then sprayed a little more water directly onto the panel - let the colors blend a bit and then dried it with my heat tool to set. I die cut the Celebration Words LOVE block out of the center of the panel, turned it over and laid foam tape around the word on the back of the panel as I wanted to back it with a piece of purple Ranger Distress Coredinations cardstock and I wanted it to have depth. 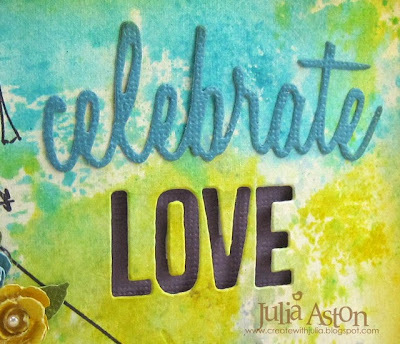 Here you can see the purple behind the LOVE cut-out as well as the Celebration Word Script - celebrate that I cut out of blue Ranger Distress Coredinations card stock and adhered to the panel above the LOVE. Here's another close up where you can see how nice the panel looks with the mixed watered down colors. 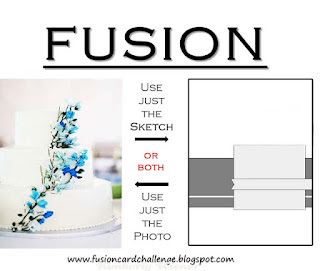 You never really know what you will turn out with when you use this technique! I also sponged the edges of the panel with Mustard Seed and Tea Dye Distress Inks before layering it to a black panel and then to the cream linen card base. My card is 4 3/4" x 4 3/4" square - so will require a special larger envelope. 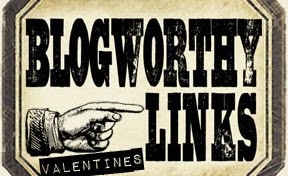 So please join us this month over at A Vintage Journey as we 'Celebrate' whatever needs celebrating!! You will find all the details of the challenge - the awesome inspiration from my fellow Creative Guides and, of course, Mr. Linky, here at the AVJ blog. 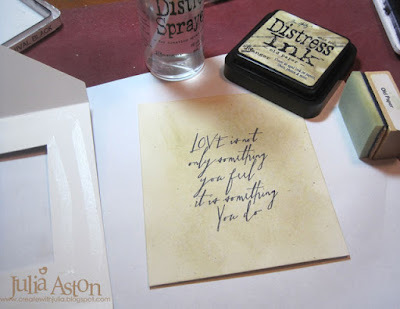 This week's Make it Monday from Papertrey Ink is to use vellum to soften a background pattern. 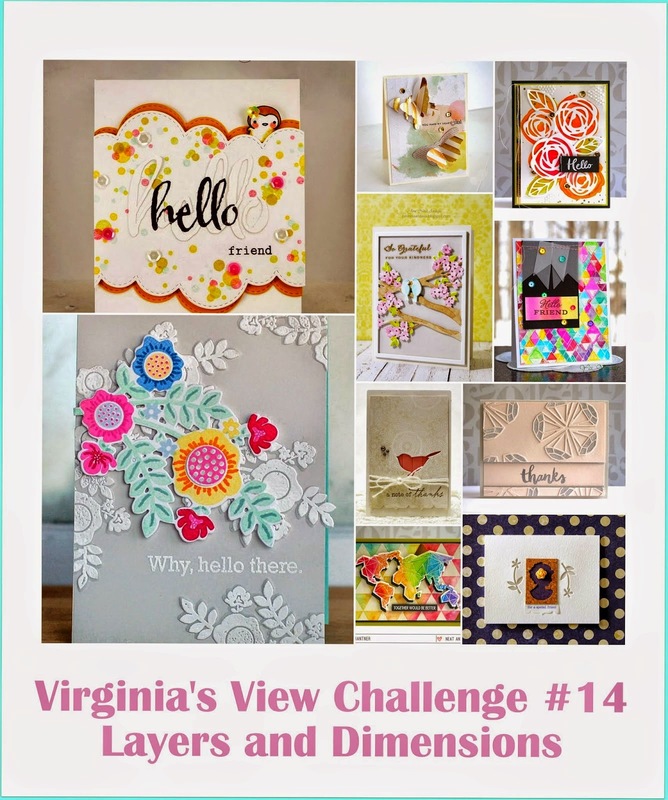 Lizzie has a great video tutorial and some pretty samples to illustrate this technique here on the challenge post. I needed some wedding cards for my stash so decided that's what I would create. 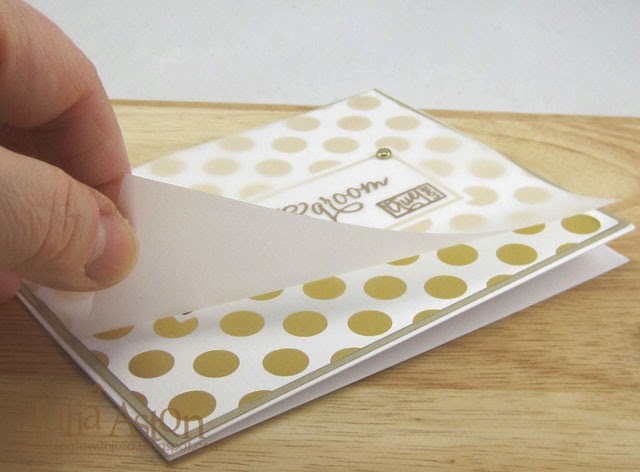 I recently purchased the pretty Luxe Foil Desigher Papers that are perfect for a classy card. The gold is a bit bright and shiny though - and layering the vellum on it softened it nicely. I ended up making two cards using this technique. I gold embossed one of the sentiments from the Love and Marriage set onto the vellum and attached the vellum just along the top of the Luxe Foil paper with Vellum Glue Dots. 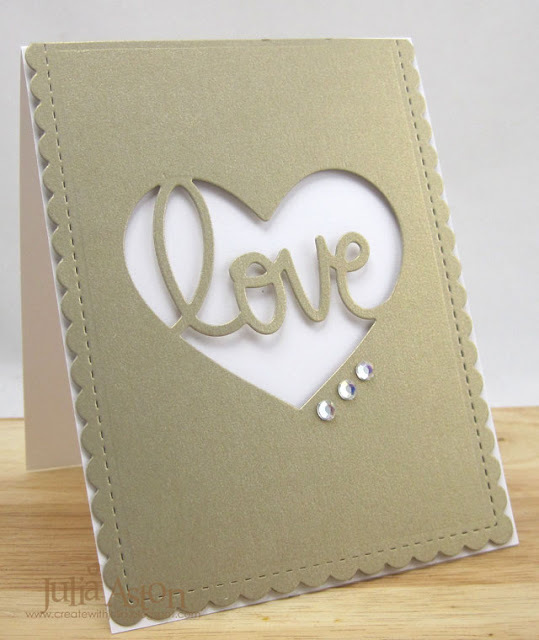 I layered the Luxe panel to a Brushed Gold Panel and than all of it to the white card base. 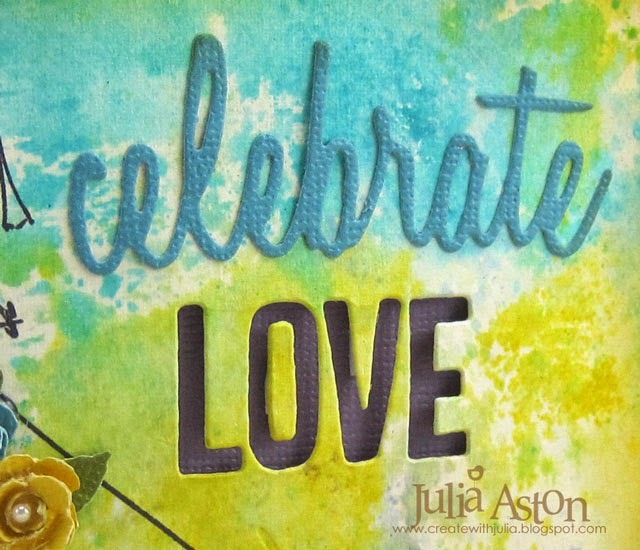 I used another pattern in the Luxe Foil Designer papers for my 2nd card - along with two more stamps from the Love and Marriage stamp set. This time I adhered the vellum with 3 tiny gold brads in the corner of the frame. I also put some of the Vellum Glue Dots along the top edge. And a view of this Luxe paper without the vellum overlay. I love how both of these came out - a fun technique to soften a bright background. 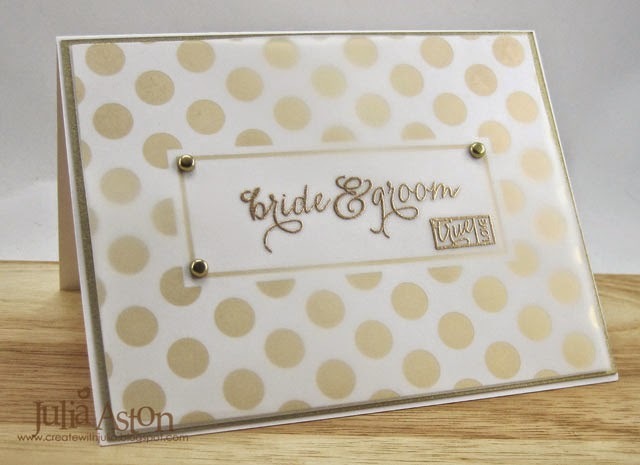 Accessories: Gold Embossing Powder, gold brads, Vellum Glue Dots. 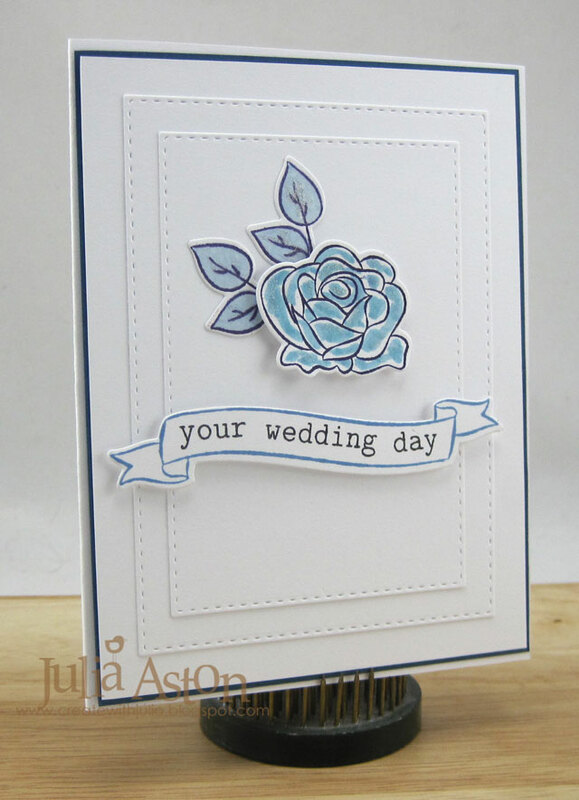 Today I have a wedding card to share - that I made using some new stuff and some old stuff! 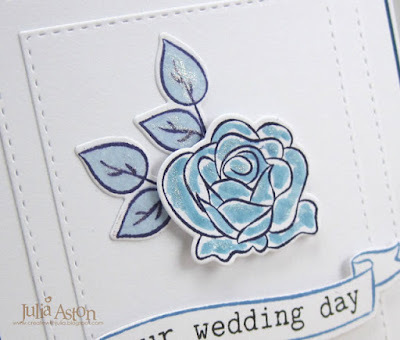 I'm linking my wedding card to the Addicted to Stamps Challenge - CAS. 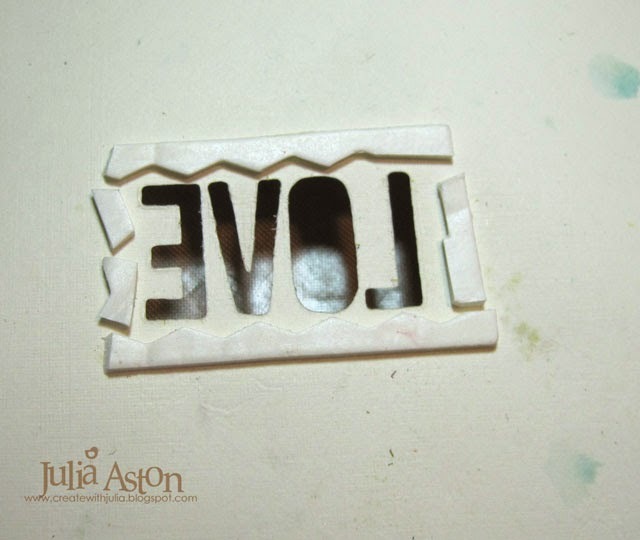 My husband asked me to make a wedding card for a friend's son and his bride to be so off I skipped to my craft room! 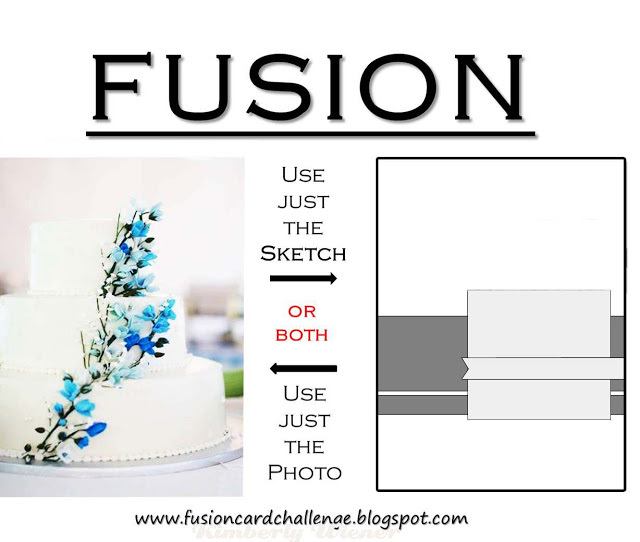 Kent likes clean and simple designs - so this is the card I came up with. I chose to use the elegant colors of vintage cream and gold. I off set the stamped panel on the gold panel just for a little visual interest. I used stamps from Waltzingmouse for my wedding card - the flowers are from Big Bloom Poinsettia and the beautifully scrolled sentiment is from Big Day Additions. The flowers are gold embossed with a gold half pearl in the center of the largest bloom. You can see the embossed gold a little better at this angle. 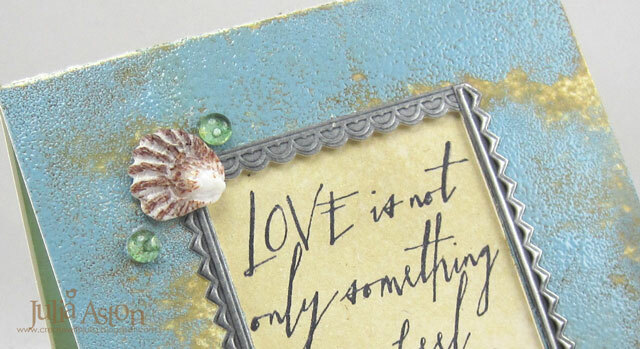 Accessories: Gold embossing powder, gold half pearl - Michaels. 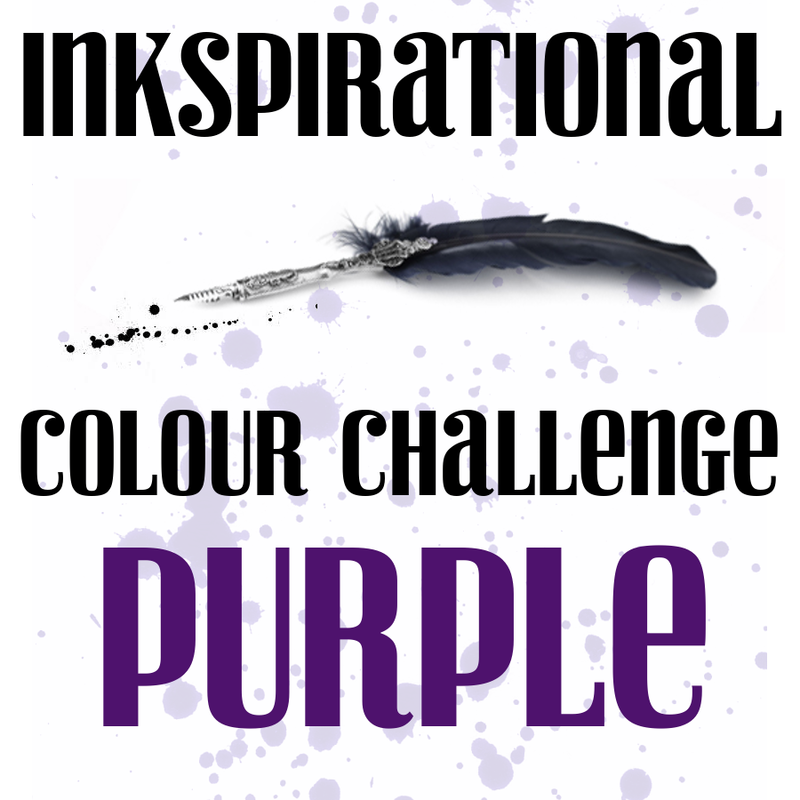 Today I'm sharing my project for the Compendium of Curiosities 3 Challenge (CC3C). 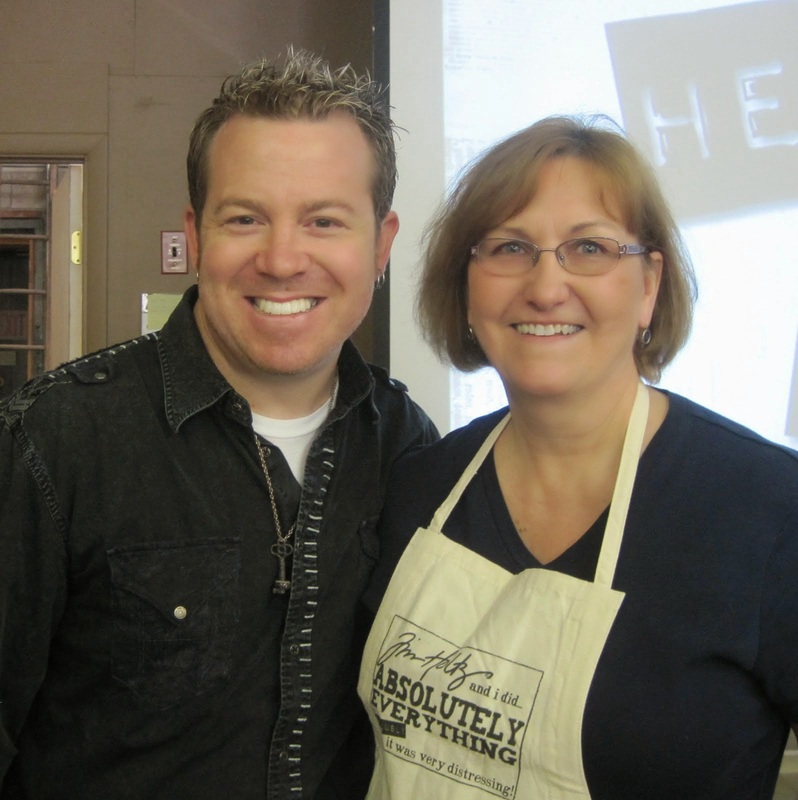 This week we are challenged to use Tim's Altered Burlap Panel Technique which is found on page 37. We cannot describe the technique - as they want everyone to purchase their own copy of Tim's book. 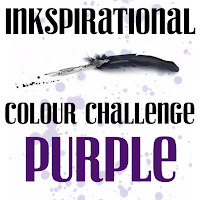 When I first saw the challenge - I decided I would like to make a memento for my friend, Flo, whose son just got married on July 6th. I had taken just a few shots of the outdoor ceremony so I picked out a photo where you could see the bride and groom's faces looking toward the camera. Here is how my panel started out as well as the photo that I printed on sticky back canvas and framed with Tim's Ornate Frame Die that cut from Grunge Board and embossed with Shabby White Frontage embossing powder. 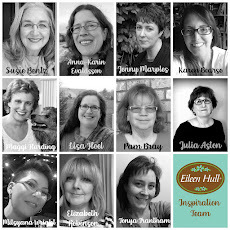 and here is my finished Altered Burlap Panel hanging proudly on my door in the kitchen (for the moment!). 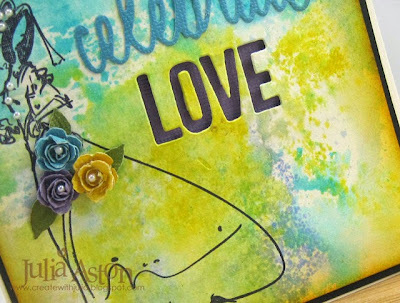 I colored the Crinkle Ribbon with Squeezed Lemonade and Iced Spruce Distress inks - mixing them with water on my Nonstick Craft Mat and dragging the ribbon through the mix. The wedding colors were yellow and grey (SO trendy!) so that was the mix I was trying to achieve. I also rubbed Scattered Straw Distress paint over the frame, the photo, the Word Key and Chit Chat Stickers with my finger. I knotted the ribbon to two Memo Pins that I just stuck into the folded burlap on the top of the panel. I stapled a piece of Film Strip Ribbon across the top leaving the ends sticking over the edge a bit. Then I layered an Adornment Arrow on top of it with Glue N Seal. You can see the lovely texture on the frame a little better in this picture as well as the Heart Charm (that says Life Journey) tied to the Ring Fastener with a little piece of twine. I ran a piece of Tissue Tape/Sketchbook across the panel above the key - but it's hard to make it out in the pictures! This pic shows the side where I folded the Tissue Wrap Melange around the edges. I like that finished look! The Voyage sticker and map of Spain (where the couple went on their honeymoon!) tucked under the Word Key are Salvage Stickers - French Industrial. Flo and Rob have invited Kent and I up to their camp on Lake Winnepesauke in New Hampshire for a couple of days next week - so I will be giving this to them as a thank you - I think they will like it as a special memento of Darren and Mary's wedding day! 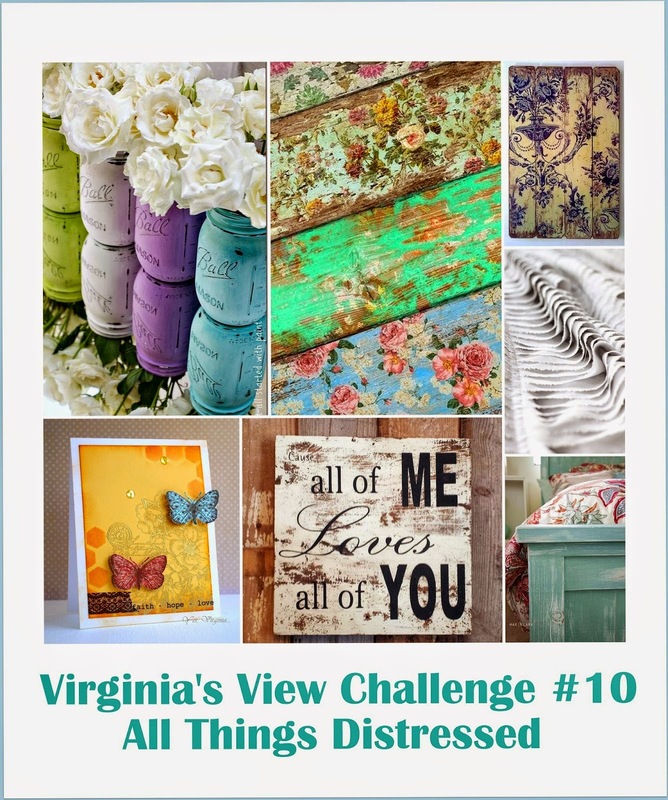 I hope you will join in on this fun challenge using Tim's Altered Burlap Panel Technique. 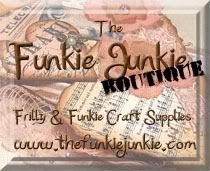 The CC3C is sponsored by the Funkie Junkie Boutique this time and a $25 gift certificate will be awarded to one lucky randomly chosen winner! There's also a prize package from Tim and Mario awarded! 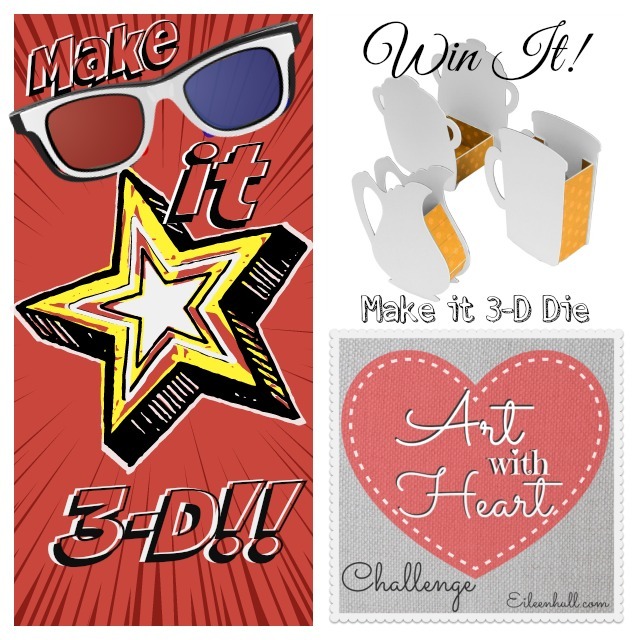 You will find the link and all instructions at the CC3 Challenge blog here. 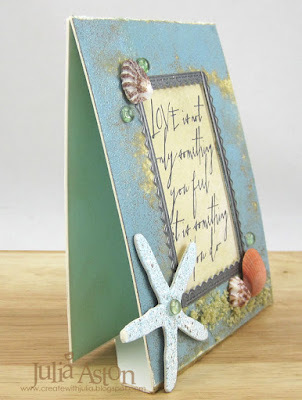 Paper: Grunge Board - Ranger, Sticky Back Canvas - Claudine Helmuth. Accessories: Shabby White Frontage Embossing Powder - Stampendous, Glue N Seal, Glossy Accents - Ranger, foam dots, Idea-ology - Tissue Wrap/Melange, Crinkle Ribbon, Tissue Tape/Sketchbook, Film Strip Ribbon, Adornments/Arrows, Word Keys, Heart Charms, Chit Chat Stickers, Salvage Stickers/French Industrial, Memo Pins; Embossit Dabber - Ranger; Ornate Frame - Tim Holtz Alterations/Sizzix, Ranger Distress Marker - Pumice Stone, Ranger Distress Paint - Scattered Straw, Burlap Panel 4" x 6" - Ranger.